The epic memoir of an Alaskan pararescue jumper, Special Forces Operator, and decorated war hero. "That Others May Live" is a mantra that defines the fearless men of Alaska's 212th Pararescue Unit, the PJs, one of the most elite military forces on the planet. Whether they are rescuing citizens injured and freezing in the Alaskan wilderness or saving wounded Rangers and SEALs in blazing firefights at war, the PJs are the least known and most highly trained of America's warriors. 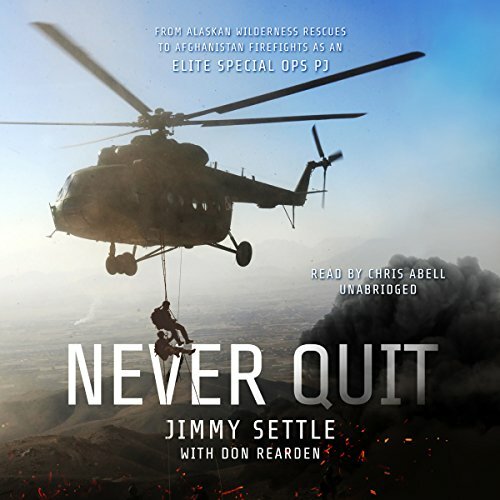 Never Quit is the true story of how Jimmy Settle, an Alaskan shoe-store clerk, became a Special Forces Operator and war hero. After being shot in the head during a dangerous high mountain operation in the rugged Watapur Valley in Afghanistan, Jimmy returns to battle with his teammates for a heroic rescue, the bullet fragments stitched over and still in his skull. In a cross between a suicide rescue mission and an against-all-odds mountain battle, his team of PJs risk their lives again in an epic firefight. When his helicopter is hit and begins leaking fuel, Jimmy finds himself in the worst possible position as a rescue specialist - forced to leave members from his own team behind. Jimmy will have to risk everything to get back into the battle and bring back his brothers. From death-defying Alaskan wilderness training, wild rescues, and vicious battles against the Taliban, this is an explosive special operations memoir unlike any that has come before and the true story of a man from humble beginnings who became an American hero.